Within the historical yacht port of Girne, the house of the 18th century now serves as museum. 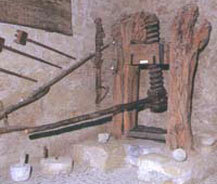 Olive oil presses, primitive ploughs, cubes, a wooden threshing sled, agricultural tools, a loom for weaving, pulley wheels are exhibited in this museum. At the upstairs through wooden stairs from entrance hall, the ancient garments, table cloths, head scarfs, woollen socks, wedding dresses, carved trousseau chests, silver embroidery bed covers, cushions, bedsteads, wooden boards and window roll-down shutters are also exhibited.